Some of you know of my dilemmas with my networking here at home already, hehe. When idiot technicians were here they changed the RJ45 port behind my TV to be phone only. I want to change it back to data port (or data AND phone). I purchased a media player a while back and the wireless adapter keeps pinging out and its a drama to reconnect so I would prefer to have it wired. I have opened up the cover of the point on wall (taken off cover). There is one blue wire and one white wire punched in. Can I do this myself without a punching tool? more to the point....can I do this myself AT ALL?? You won't be able to have data there unless the cable is at least CAT5 and runs back to a central hub/cabinet, where you can patch in phone & data etc. Scratch that, just read your other posts. You should be able to do it with a couple of splitters if the RJ45 is punched down correctly, ie not just the blue pair. Ive just read that the side of a credit-card can punchdown tools sufficiently. b) Data + Voice on a single Cat5 (really bad practice). 2 wires for voice + the 2 unused spare wires to the 2nd RJ45 port for tidyness and if you later want to switch to data you only need to change the patch end. However that outlet looks like it just has one RJ45? ok, I just rigged up the wires to look exactly like the ones in another room. That didnt work :( Im testing it with my laptop wired to the port. Maybe its something set up at the hub end? Ragnor - Yep, that socket just has the one RJ45. It's probably only got 2 wires connected at the patch panel end of the cable, need to fix it there too. All 8 wires to a data port or punchdown in the patch panel. What does the other end look like ie: patch panel? 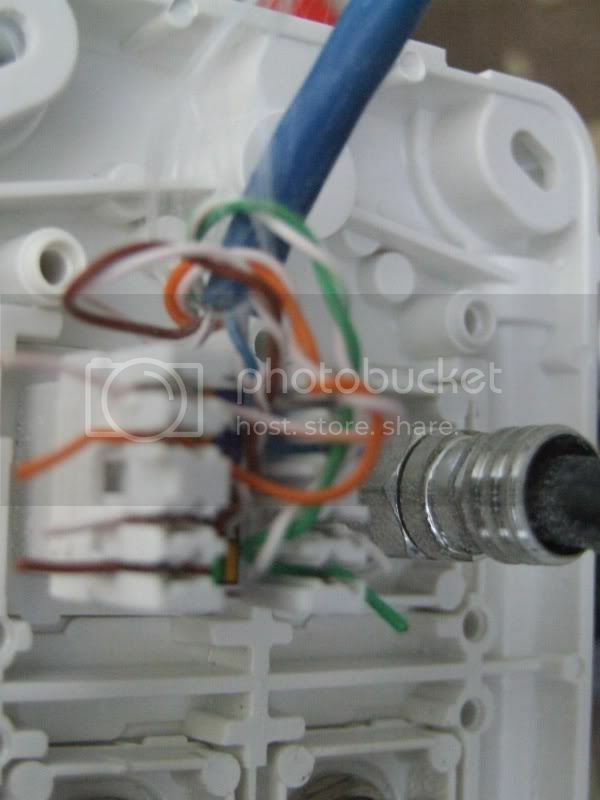 From the photo of that outlet, it doesn't look like the sparkie has followed the colour coding on the keystone/port? Normally the color coding matches with TIA/EIA 568A or 568B standard so it's easy to wire the other end the same. 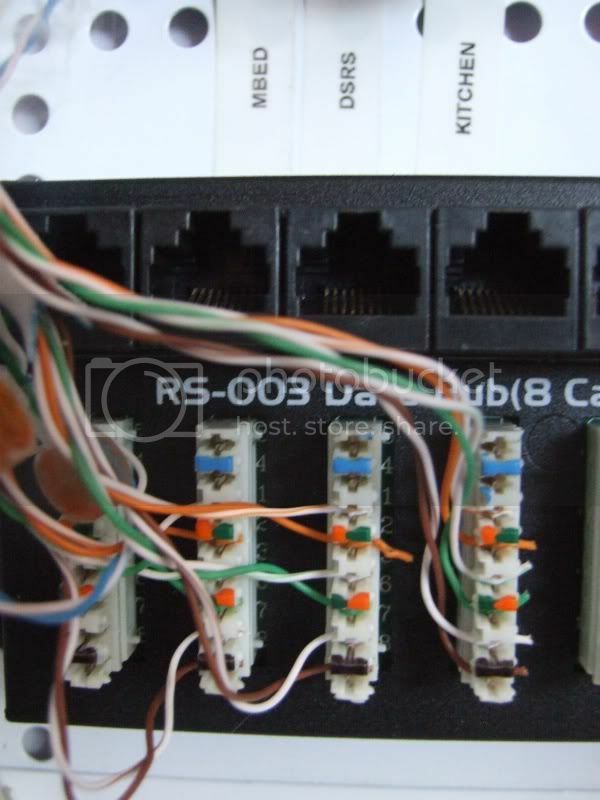 Is there an RS-002 or way telephone block/module where all the blue wires are going? Can you take a shot of the whole panel? 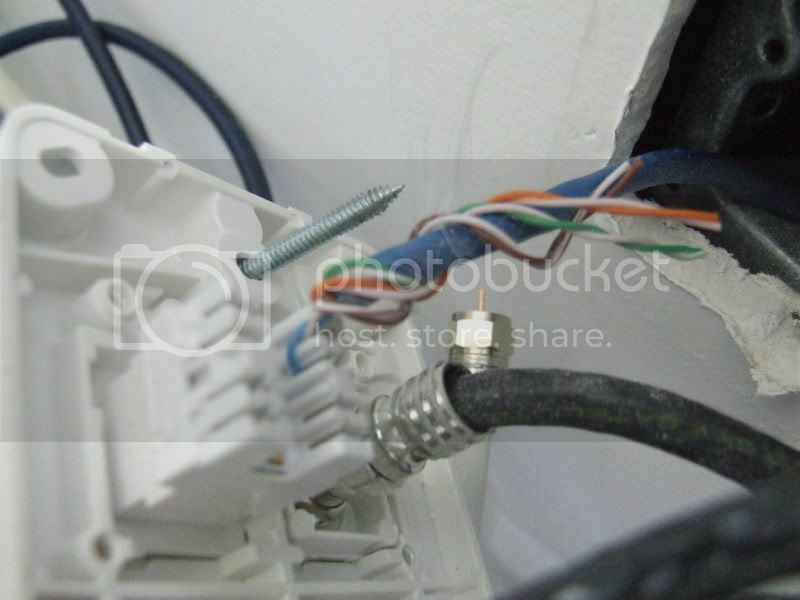 If the lounge was voice before and you want to change it to data then the cable will probably be one of the cables going to the top voice block currently. Figure out which one it is (process of elimination I guess) then remove it from the voice block and connect it to the next spare port on the data block (looks like 5th across). The other ports on the data block look like they are following 568B wiring standard (from diagram I posted earlier) so just do the same as the other data ports. 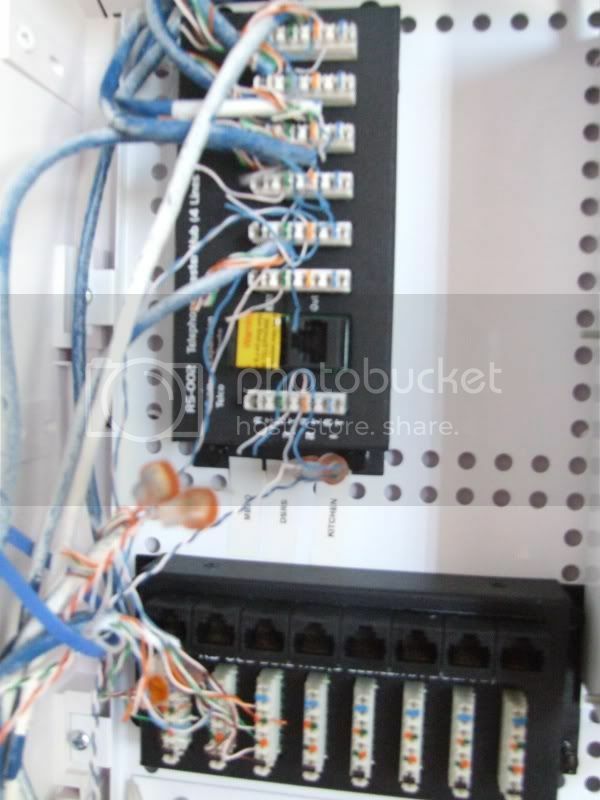 However also connect the blue & blue-white wires too (blue-white to the 1st pin numbered 5 and blue to the 2nd pin numbered 4) because you need all 8 wires (4 pairs) if you want Gigabit lan to that outlet. I think your Tiara is upside down? If you move that, all will work! Thats a shocking mess, but I just rememberd Shelly we have been here before. I think back then I mentioned that its a nasty idea to wire sockets for two services, its better to wire the line from patch panel to TO as a full 4pair setup, then use line splitters to seperate out the services should you want to put both down the cable. This way there is no issue with moving to GigE in future and the cabling stays in place so no special tools are needed, it also clearly identifies what has happened. And yes your tiara is upside down, and slipped. Cyril, approximately how much does a ST2206 phone patch cost? 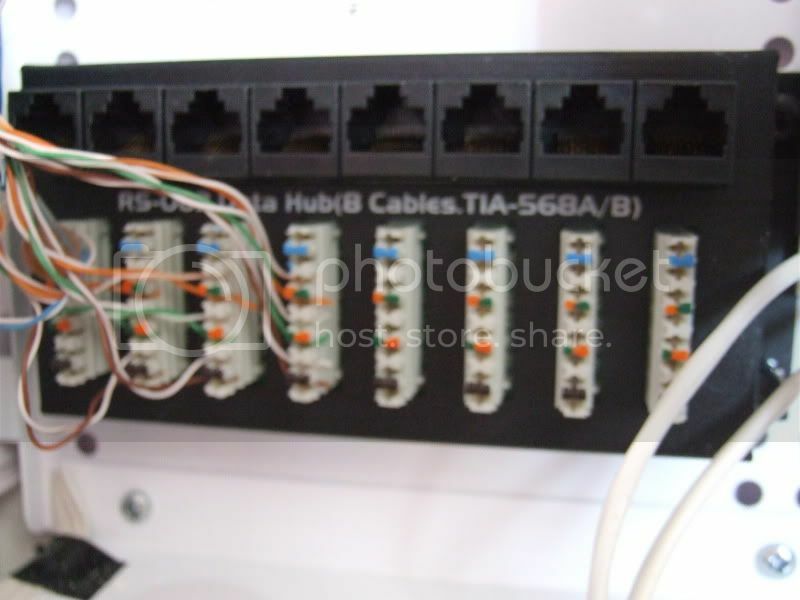 Then replace the RS-002 with ST2206 so any RJ45 outlet can be patched to be a phone outlet as needed otherwise can be used a data. Hi, normal trade is around $50 then there is the filter which he already has. And yes I agree, all connections fully wired (as it always should have been), proper phone patch unit (ie ST2206) and proper plug in line splitters as I linked above. 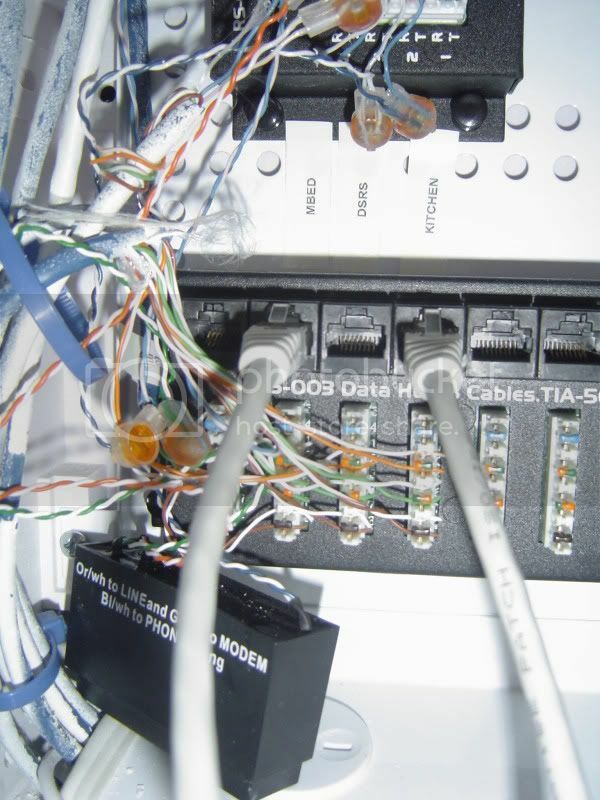 Yeah I saw that on the Sigtech site, it's hard to tell from the photo's but Shell: are there 9 Cat5 cables or 8 (don't count the phone line coming in)? I guess Shell doesn't really want to spend any $$$ on this mess when it should have been done right from the start though. Alrighty, there appear to be 11 blue cat5e cables.